Google street view in Sequim is finally here! This is good news for my buyer clients who come from out of state. Google street view in Sequim is a great way to drive around on the ground and see real photos, a series of photos that Google has taken driving through Sequim. At this point, the photos are limited, but the fact that Google has boots on the ground is a good sign and presumably the beginning of opening up our area to photos on every street eventually. 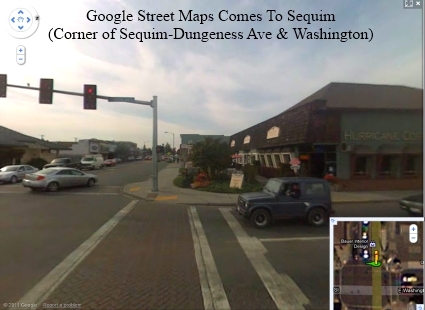 Google street view in Sequim is limited to entering the map on your computer at the corner of Sequim-Dungeness and Washington Avenue. From that intersection, you then can follow the yellow line (not the yellow brick road) and you can use your mouse to go north or south on Sequim-Dungeness to the Highway 101 (and up and down 101 east and west), and you can “drive” south on Sequim-Dungeness all the way out to where the road turns into Anderson and then east on Old Olympic Highway toward Port Angeles. I also take many photos and videos of the Sequim area so my clients and others can see what Sequim is all about. I love Google street view in Sequim, but it is still under development and will probably be a while until all Sequim streets are in the Google system. Meanwhile, you can also enjoy hundreds of photos on this blog as well as vidoes I’ve taken at Sequim Real Estate Videos. Google street view in Sequim is alive!